Despite its reputation as a party resort, away from the main party area this stunning island is home to some of the most beautiful beaches, secluded hideaways and sophisticated night life on the Mediterranean. From chic beach clubs to high-end dining hotspots, Ibiza is this year’s place to be seen. The rich and famous have flocked to the island for many years looking to soak up the famous chilled-out atmosphere, and have been happy to keep the secrets of this tranquil paradise all to themselves… but we’re here to let you in on that secret. Shhh…Ibiza is so hot right now! At Villa Retreats we make it our goal to ensure that we know all there is to know about the locations in which our luxury villa rentals are situated, so that we can share these tips with our customers to ensure they get the very most from their luxury retreat. That’s why we venture regularly on fact-finding trips to areas such as Ibiza. Sounds like a terrible job doesn’t it? I can think of worse ways to spend a working week than chilling with a cocktail in a “Chiringuito” bar, sipping a cocktail watching the sunset on Cala Comte beach and enjoying a delicious meal in one of the island’s many sophisticated eateries with a cocktail in hand (are you sensing a cocktail theme here or is it just me?). All in the name of research of course! Now that I’ve stopped dreaming about cocktails it’s time to share some insight into some of our favourite spots in Ibiza. Ibiza is only 24km long and 17km wide so no matter which of our luxury Ibiza villa rentals you choose from you will never be more than a 30 minute drive from where you decide to venture to each day. Some of you may prefer to spend your holiday simply relaxing by your private pool (cocktail not obligatory), but for those of you who wish to get out, mingle and soak up the famously unparalleled vibe of this hedonistic island then here are our recommendations. Ibiza is famous the world over for its plentiful beach bars and beach clubs but if you’re looking for a relaxed and indulgent day by the beach away from the party scene then where should you go? One of our personal favourites is “Amante”, located on the secluded Sol d’en Serra beach. Surrounded by dramatic rocks, lush greenery and crystal clear waters this is a perfect spot to enjoy a long lunch or a romantic dinner. Amante even has its own movie nights where you can enjoy a glass of wine and some popcorn in one of the most atmospheric open-air cinemas in the world. On the quieter west coast of the island you will find Cala Bassa Beach Club, a beautiful bar and restaurant with unparalleled views and sophisticated dining. Enjoy a glass of champagne overlooking the harboured boats or try some sushi as you soak up the sounds and atmosphere of this glorious beach spot. Another of our favourites, this time on the north of the island, is the world class Café on the Beach on Cala St Vincente. Offering delightful cuisine and delicious cocktails one could spend all day here enjoying the sun and the welcoming hospitality on offer. For pure Ibizan cool you should check out the Cotton Beach Club in Cala Tarida, an ultra stylish venue boasting two first class restaurants and fantastic beach service. Set up for the day on one of the VIP sun beds with jaw-dropping views across the Mediterranean and enjoy the outstanding cuisine on offer. There is also a charming rooftop dining option which is a particular favourite of ours. This beach club is definitely the place to be seen so why not avail of our concierge service and make sure you have a reservation at Ibiza’s hippest beach spot. For those of you wishing to enjoy the music that Ibiza is famous for then Blue Marlin is where you need to be. Set in the beautiful Cala Jondal Bay this exclusive beach club is now a very popular destination for the rich and famous, with chilled out vibes and exceptional Mediterranean cuisine served during the day, and live music playing until 4am. Proving you don’t have to be in the “party area” to enjoy a party. If you’re looking for something a little more casual then you need to check out some of the island’s many Chiringuito bars. The Spanish describe a Chiringuito bar as a “kiosk on the beach” and this is pretty much exactly what they are. 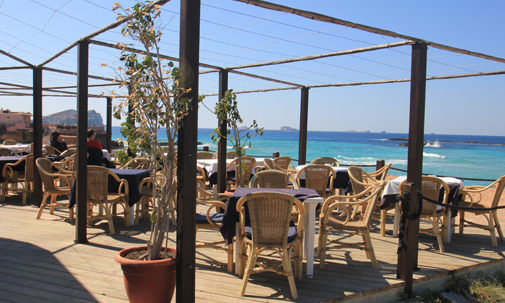 Though the Chiringuito bars in Ibiza are more than just a kiosk. No Ibiza holiday is complete without enjoying a drink or a snack in a little wooden shack on a glorious sandy beach with the waves lapping in front of you. If you’re looking for a quiet, casual and relaxed atmosphere then make sure you seek out some of these laidback but utterly welcoming bars. 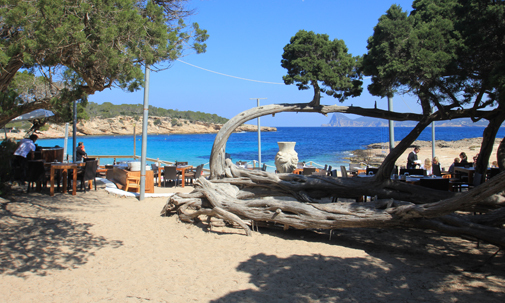 Our favourite Chiringuito bars can be found on the beaches of Cala Codolar, Cala Escondida (a hidden beach in the bay next to Cala Conta) and Es Pàs de s’Illa beach. 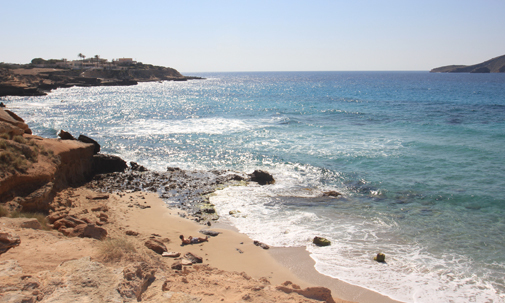 Es Pàs de s’Illa is a particularly secluded beach that even Ibiza regulars struggle to find. Situated next to the port of San Miguel, if you want to visit this secret beach you must climb over a small cliff and follow a very narrow path but once you get there it really is worth it! Of course you can always avail of our concierge service if you want to find a way to get there in style. Despite its beautiful sandy coastline Ibiza isn’t all about the beach. Moving inland opens up a host of stylish venues that offer their own unique brand of hospitality, cuisine and atmosphere. Take KM5 in Sant Josep de Sa Talaia for example. 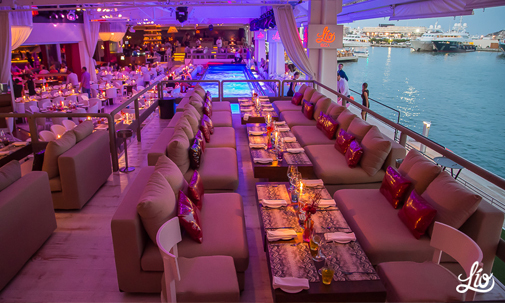 Thought of as one of Ibiza’s most glamorous and cosmopolitan spots, KM5 features a wonderful restaurant, sushi lounge, open air lounge garden, a boutique, an art gallery and a club! Talk to our concierge team about reservations and transport to ensure you arrive in style. Ibiza Town itself also serves up its own array of first-class cuisine options including “IT”, a delightful club lounge and restaurant with remarkable dishes from Michelin starred Chef Gennaro Esposito. Located in the beautiful Marina Botafoch and featuring exceptionally stylish design in both the ambience and the food, make this one of the first places on your list to try. Continuing with the Marina Botafoch theme if you fancy a fun-packed night of entertainment, top quality food and unbeatable views then make it your mission to get to Lío Ibiza, a lively but fun hotspot where the island’s movers and shakers come to enjoy high quality dining, daily dinner shows and live music. Lío also has club nights that start around 1am but if that isn’t your thing there is plenty more here to keep you satisfied. 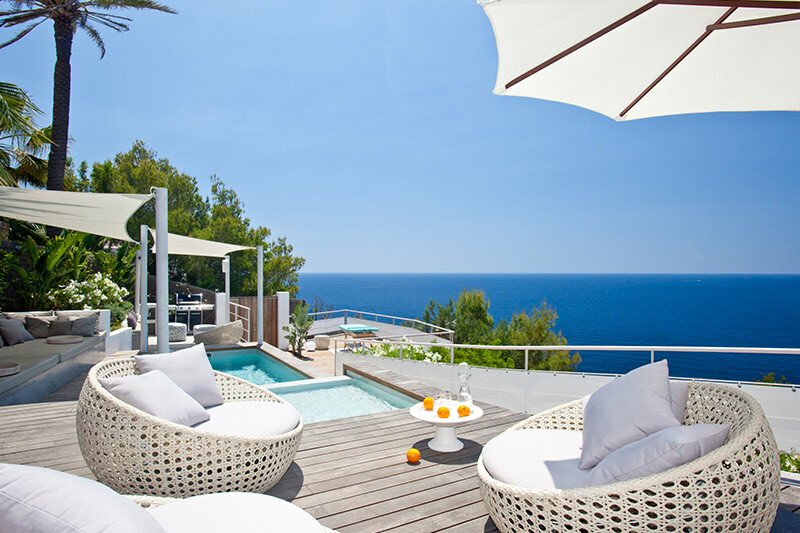 Wherever you decide to visit you can be assured that one of our luxury Ibiza villa rentals will set the tone for a relaxing, indulgent and sophisticated holiday, so why not contact one of our team today to discuss your requirements and find out more hints and tips. And once you decide to book we will be on hand every step of the way to help you find the perfect secret spots ideal for you. Now where did I put that cocktail? ?